Chatting over climbing ideas with Joel, he suggested a one day bin-to-bin ascent of the Frendo Spur. I wasn’t sure this was the most sensible idea. 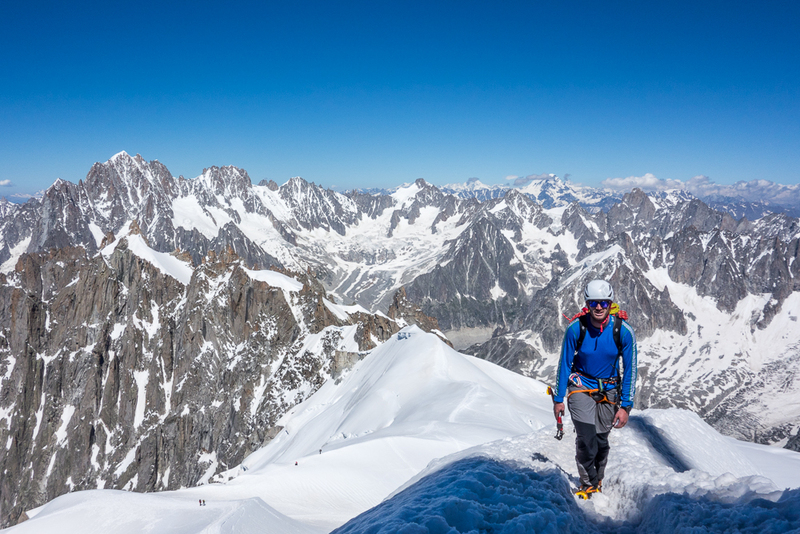 Chamonix was in the midst of a scorching heatwave and whilst the rock would be dry, making for quick and fun climbing in the lower section, the snow and ice at the top would be soft and mushy, offering slippy foot placements and dubious chances of self-arrest. 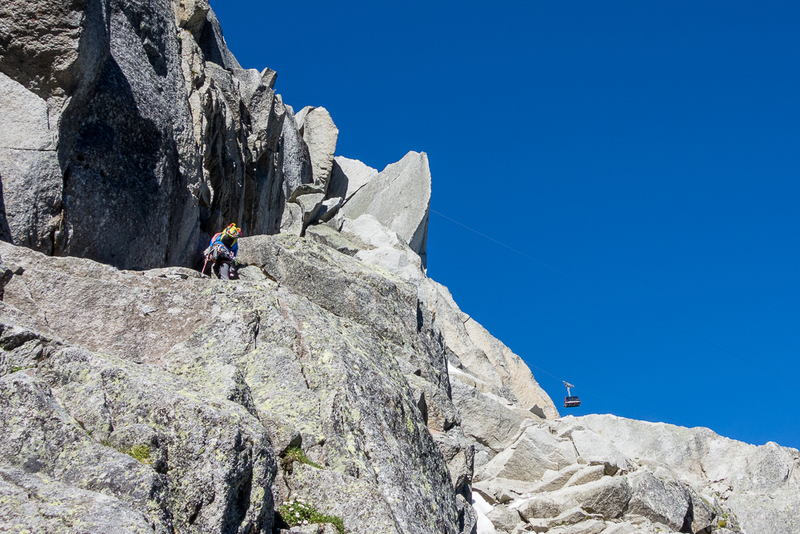 Nevertheless, I’d been keen to climb the Frendo for a while and fancied a fun little adventure. Ultimately we reasoned that if the snow really was too soft then we could always wait at the top of the rock section for nightfall and for the snow to refreeze. Happy that we had this safe Plan B, we agreed to meet bright and early the following morning for the first lift of the day, psyched for what would hopefully be a fast and fun alpine hit! The line of the Frendo Spur. At 1200m, it’s longer than it looks, particularly that bit of snow and ice at the top; here you should refrain from comments like “we’re only 15 minutes from the top” and “just 50m to go”. You will likely be proved wrong. After an early wake-up to grab the first lift of the day, we hurriedly walked over to the base of the route, about an hours hike from the Plan d’Aiguille lift station. The first 100m of the route weren’t great fun, with care required to navigate our way through a load of loose choss. However, we soon got ourselves onto some better rock and started making steady progress up some great granite slabs and cracks. As expected, the day was very hot. 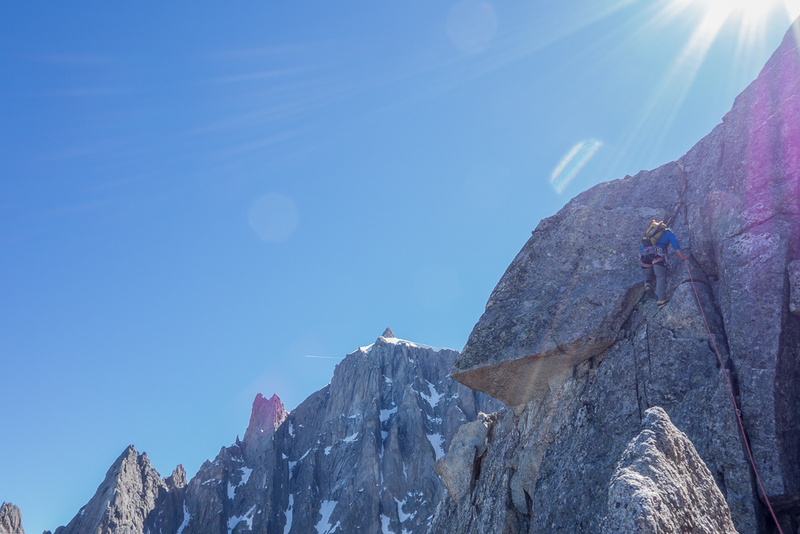 Usually you’d expect to be pretty cool on an alpine north face at 3000m in the early morning. We were sweating like pigs. After a few hundreds metres of easy climbing we encountered the first crux of the day, a short but steep corner (5b). Joel led on up making swift work of this first crux. Joel sensibly chose to climb this wall be veering right along the diagonal crack, not straight up. If you climb the diagonal crack on the right you then have to elegantly shuffle your way along a fine edge to get back onto the spur (Joel demonstrating good form in the photo above). Though a bit awkward and exposed, it’s not too hard. I foolishly decided to ignore Joel’s advice to take this diagonal crack and instead went for a tempting crack on the far left. I quickly regretted this and soon found myself shouting at Joel to take in the slack whilst praying he had some decent gear in. 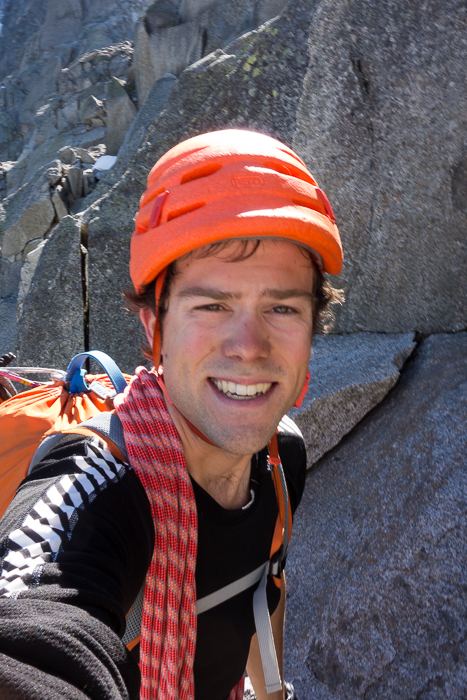 Continuing upwards, we found more typical Frendo terrain – cracked, slabby granite with bomber holds and enough edges for good foot placements. 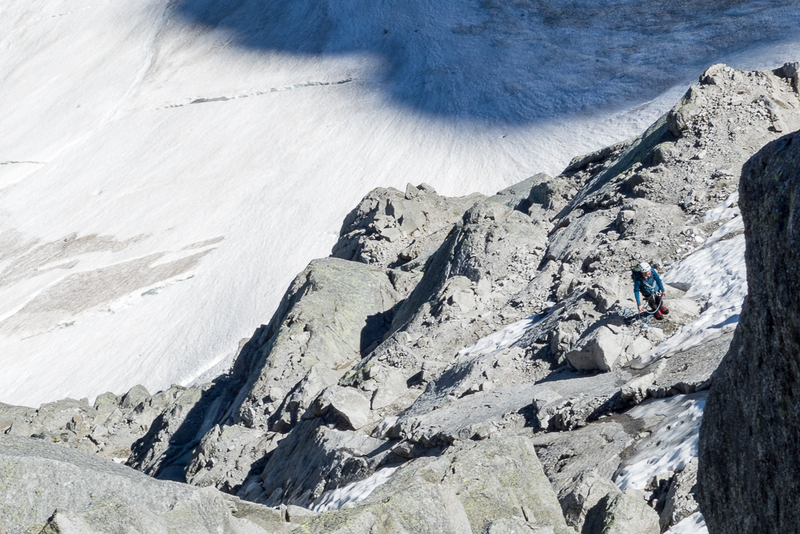 If you stay on the route, 95% of the climbing should feel no harder than 4c. About two-thirds of the way up we briefly stopped moving together to pitch the crux pitch (5b/c). Overall it’s not as hard as it looks, bar one or two steep slab moves which are a bit awkward in stiff mountaineering boots. This in theory should have been the end of the difficulties but right near the top of the rock I once again ignored Joel’s advice on where to climb and led us up some awkward thrutchy chimney (sorry Joel!). 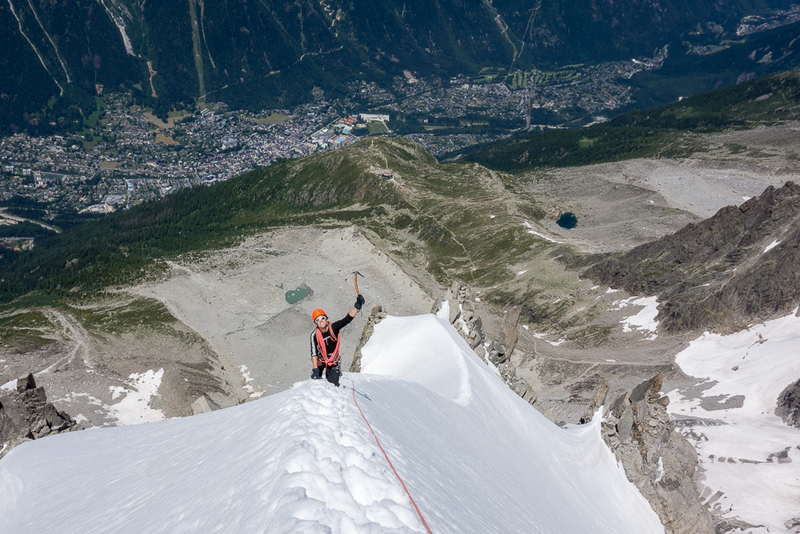 After the rock section it’s straight onto the classic knife edge snow arête. The snow here was pretty slushy, though fortunately not as soft as feared. 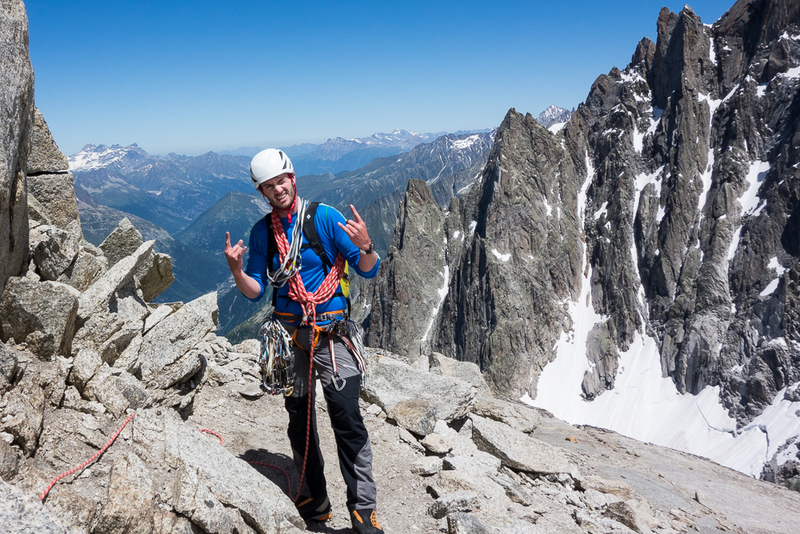 After a brief discussion over what calls to use if one of us fell off the arête (we decided on shouting the direction in which you want the other person to jump), I handed over the lead to Joel who proceeded to break trail whilst carrying our heavy rack (thanks Joel!). Another hour or so of climbing through some rapidly melting ice – perfect for deep, reassuring axe placements, not so good for ice screw placements – we reached the crux of the snow and ice section. In years gone by this crux was a steep pitch of near vertical ice. However, glacial change has now made things much easier. 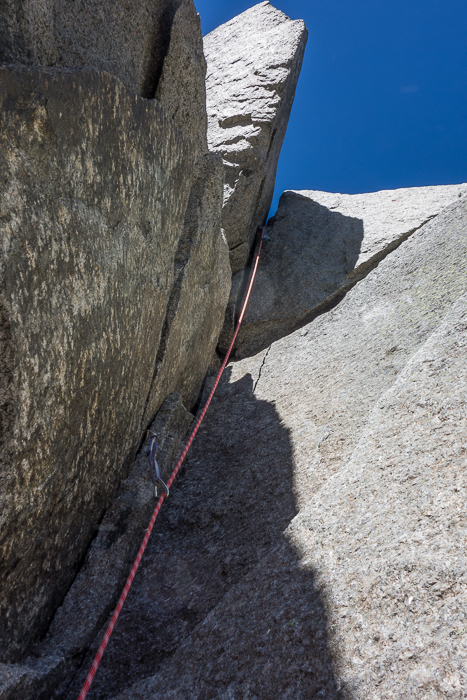 These days this crux pitch goes at around grade 2, never steeper than 70 degrees and only about 10-15m long. After the ice crux, a bit of easy snow plodding brought us to the summit cornice. 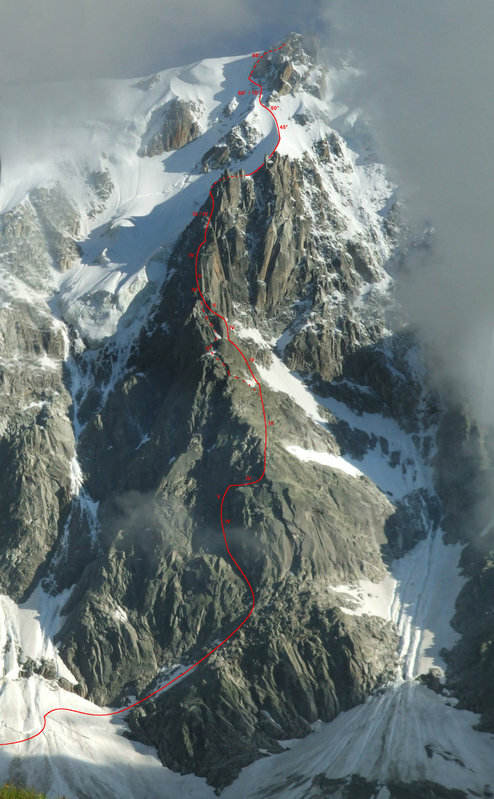 Pulling over this, we found ourselves right at the base of the Midi arête, six and a half hours after starting. 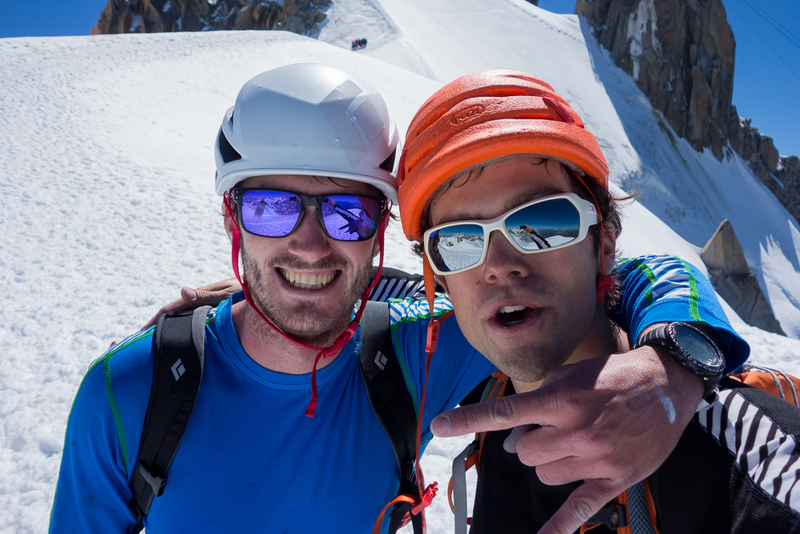 We were pretty wasted but psyched to have made it up well in time for the last lift back down to Chamonix. 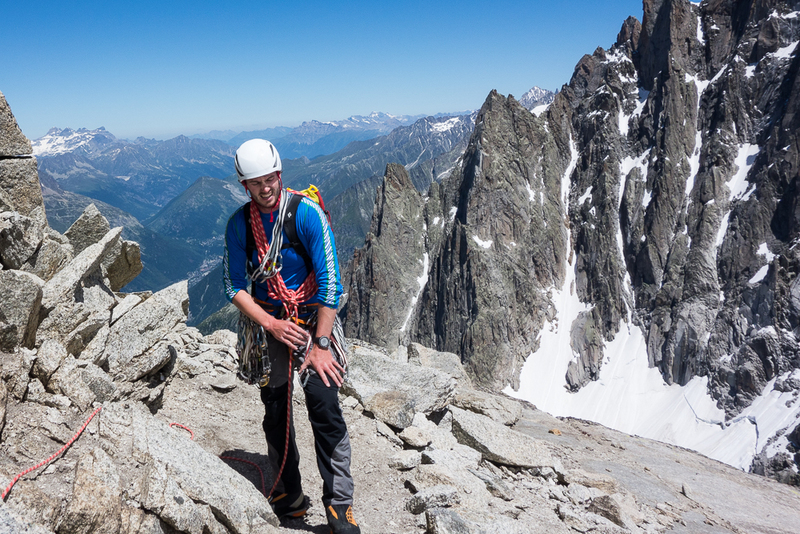 A quick march up the arête and 30 minutes later we were back in town, glugging beer and getting stuck into some burgers at Monkey. 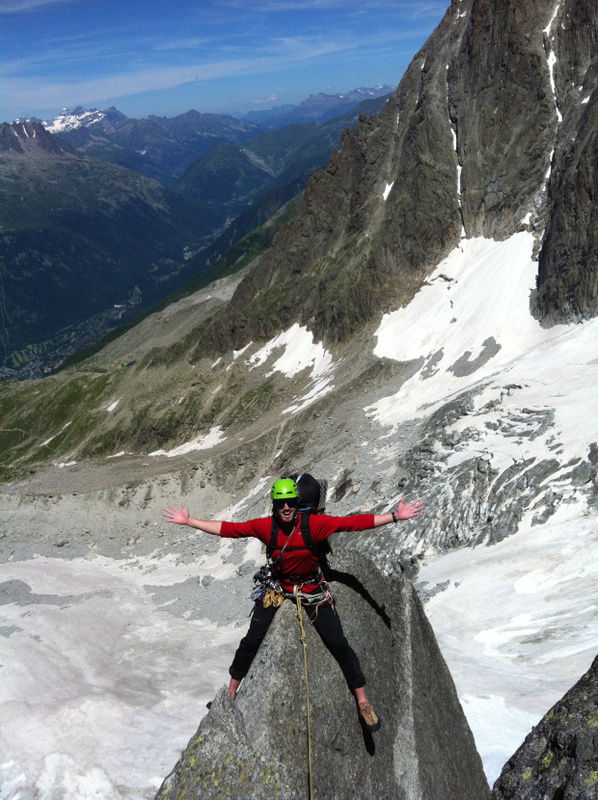 Chamonix alpinism at its best!